(CNS): Prospect Primary School students from Jayme Farrell’s Year 3 class helped to raise much needed cash for an East African school when they took part in the Write to Give Programme organised by the Canadian charity World Teacher Aid. The first time a school from Cayman has participated in the writing initiative the kids worked with four other schools in Canada to write a narrative story. Farrell’s class was chosen to write the end and the completed book was then published. Students were able to buy and sell copies of the finished book to family and friends with the proceeds going to provide children in Lamolo, Kenya with a school and resources. 34 different books were written by students from the Cayman Islands, Canada, USA, Hong Kong, Japan, Australia, Netherlands and Switzerland, this year and more than 3000 copies were sold raising over US$45,000 for the Kenyan school. “While participating in the programme, students learned the essential elements of a fiction text, generated interesting ideas with their classmates, and collaborated with schools in Canada,” said Farrell. “They thoroughly enjoyed writing the ending, especially since they were able to solve the main problem in the story, whilst creating a funny and interesting final thought to the book which would leave the reader with a smile on their face. Through this initiative, students were not only able to develop their literacy skills, but also became global citizens, as they learned about other children’s cultures and needs in the world,” she added. Prospect Primary School Principal Gloria Bell said it was an authentic and rewarding opportunity for students to make a difference in the lives of others. 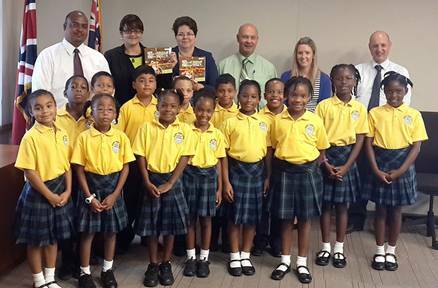 Education officials also got a copy of the book including the education minister Tara Rivers who said she was delighted to meet the talented students who co-authored it. “Such initiatives are truly important for the development of our students both academically and as global citizens who actively and positively contribute to the world around them. I congratulate the students and their teacher on this success and I hope that more of our schools and students will get involved in such projects,” Rivers added. World Teacher Aid is a Canadian charity dedicated to providing and improving educational opportunities in the developing world. Their vision is accomplished through renovating existing schools and building new ones for internally displaced communities that have been uprooted from their homes. Their current projects are within Kenya and Ghana. Their Write to Give Programme is designed to empower primary school students to become published authors while giving back to children in developing nations. To find out more about this charity and their Write toGive Programme please visitwww.worldteacheraid.org.